The K'NEX Educartion sets listed below have been discontinued, but we include them to assist you if you are thinking of buying one of the sets second hand. Large general-purpose K'NEX set, with a good mix of classic K'NEX parts. Introduce students to the scientific concepts associated with simple machines - Levers,Pulleys,Wheel & Axles, Inclined Planes,Gears,Wedges,Screws. Very large classic K'NEX set for use in the classroom. Includes comprehensive instruction books, and four storage boxes. Set which combines classic K'NEX components with Micro K'NEX and KNEX Bricks. Supports up to 6 pupils. Builds 25 models, including Owl, Jet fighter, Pirate ship, Tractor, Big Rig, Swing ride, Gear assembly, Helicopter, Robo mouse, Chomping fish, and many more. And you can build three of each model at the same time - no more fighting over instruction books and all the best bits! 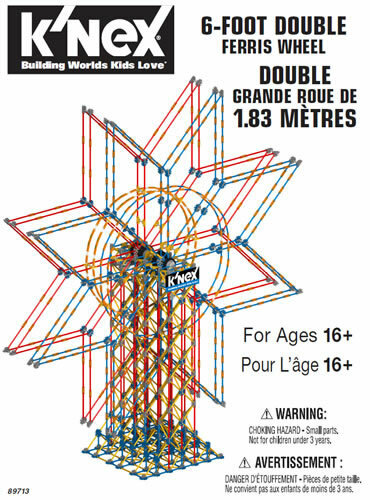 A K'NEX set designed for younger children. Builds 18 models, at least 2 simultaneously. Allows children to combine K'NEX building with materials such as cloth and card. 40-page building instruction book. Includes two syringes and 33cm of tubing. Supports 6-8 pupils. STEM concepts come to life as students build and control K'NEX models using the K'NEX Discover Control Box. The control box is an intelligent box that can remember the order and duration in which switches are pressed, and the time between the presses, then play back from memory. Stores up to 64 actions and allows for multiple outputs (motors, LEDs, buzzer) to be controlled simultaneously. Build 5 K'NEX models, one at a time. Models are fully functioning replicas of exciting real-world amusement park themed models and include Gateway, Spinning Carpet Ride, Double Ferris Wheel, Swing Ride and a Tramcar. A major advantage of the Discover Control box is that it does NOT require a computer for its operation, as all functionality is controlled via the switches on the control box. However, PC-compatible software is provided in the set, which allows students to simulate the operation of the control box on their computer. 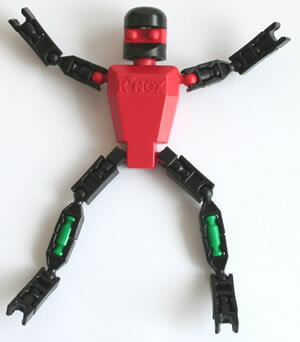 General-purpose set to introduce children to the classic K'NEX construction system. 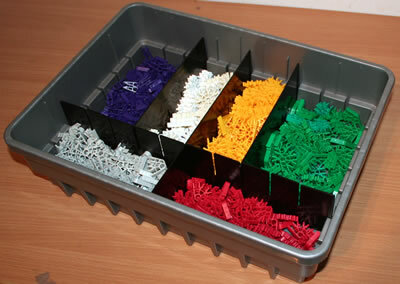 256 K'NEX rods and connectors to build 20 different models from colour-coded building instructions. A K'NEX curriculum set that helps younger pupils learn about numbers, shapes and symmetry. Builds 44 models from instructions, including squares, rectangles, trapezoids, rhombi, prisms, triangles and quadrilaterals. Includes 50-page Curriculum guide on CDROM. Supports 2-4 pupils working as a team. ♦ Developing spatial relationship, spatial memory and spatial visualisation skills. Instruction cards for 20 models. Supports up to 8 pupils. 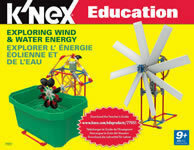 Go green and bring science to life with the fascinating K'NEX Exploring Wind & Water Energy Set. Learn how to convert wind and water power into electricity, to drive working K'NEX models. Off to the races with K'NEX Education! 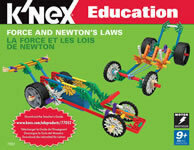 The K'NEX Forces and Newton's Laws building set has been designed for students to investigate a variety of concepts related to forces, energy, and motion. The set includes 115 K'NEX parts including a Battery motor, Spring motor and Fly-wheel motor  enough to build 11 different vehicles, one at a time. The Forces, Energy & Motion set offers an exciting, hands-on opportunity to explore fundamental physical science concepts. Includes 2 blue battery motors, 2 flywheel motors, and 4 transparent spring motors. Instructions to build 11 models; 4 of most can be build simultaneously. Comprehensive teachers guide with 7 enquiry-based lesson plans. Key Concepts: Potential Energy (Gravitational & Elastic) ~ Speed/Velocity ~ Kinetic Energy ~ Friction ~ Inertia ~ Motion ~ Force. Supports 8-12 students working in groups of 2-3. The perfect K'NEX starter kit for your Makerspace! The K'NEX Maker kit Basic includes rods and connectors in both classic and micro scale. Includes 50 models to build, 11 of which may be found in the full-colour instruction book, and a further 39 as online downloads. You can also ask your budding Makers to use the parts to design and create their own DIY projects. A fascinating larger K'NEX set for your Makerspace! The K'NEX Maker kit Simple Machines can be used to build 22 simple machine models, using gears, levers, pulleys, wheels & axles and more! 3 individual instructions books are included so students can build up to 3 models at the same time. Once they learn the basic principles of how each simple machine works, your budding makers can use the parts to design & create their own DIY contraptions. This set allows students to build, investigate, and experiment with motorized simple machine models. Multiple models may be built simultaneously, including fishing rod, block and tackle, saw mill, crank fan, gear box, egg beater, conveyor belt and ferris wheel. The models demonstrate: levers, pulleys, wheels and axles, inclined planes, wedges, screws, gears and motion. 75 page teachers guide. 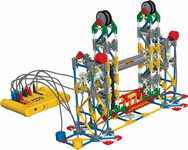 The K'NEX Simple and Compound Machines building set helps children to develop their understanding of how machines work. The set includes 352 K'NEX parts  enough to build 16 fully-functioning replicas of real-world machines, one at a time. Intriguing K'NEX set that builds 10 models from space history, including Saturn V Rocket, Apollo Lunar Lander, International Space Station and the Hubble Telescope. Activity cards for 10 models provided. 136-page guide provides NASA links, charts and 9 lesson plans for teachers. The K'NEX STEM Explorations set comes complete with 820 K'NEX parts, enough to build 9 computer-controlled models, one at a time, a K'NEX Interface and software (with site licence), motors, push button switches, reed switches, a buzzer, and LEDs. The set is designed for students to investigate a variety of concepts related to science, technology, engineering and maths (STEM). A medium-sized K'NEX set based on the theme of "Transportation". Contains 44 activity cards, and builds multiple models simultaneously. 60-page teachers guide featuring 168 activities, background information and challenges. Includes a red tethered battery motor and 2 spring motors. Supports up to 12-16 students working in teams of 3-4. 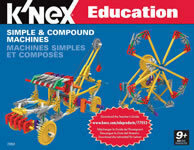 Popular K'NEX education set based on the theme of Vehicles. A large Kid K'NEX set that enables children to build a range of "creatures". Builds 9 models simultaneously from large instruction cards - Tadpole, Frog, 2D Caterpillar, 3D Caterpillar, Butterfly, Moth, Egg, Chicken, Flower. Life cycle diagrams and extra large photos of real life creatures included on the reverse side of each card. Perfect for science and nature curricula. Supports 10-12 children. ...and as always with Kid K'NEX, children can use their imagination and creativity to devise their own models. Supports 10-12 children. Bring the excitement of Kid K'NEX to the classroom with this fun and engaging life science set. Big, bright and colourful Kid K'NEX pieces, lots of eyes, and more provides young learners with the motivation to build, role-play, and learn. Set includes eyes, fins, tentacles and beaks, plus eight two-sided 1:1 correspondence building cards perfect for young learners and a Kid K'NEX Food Web Poster. Build up to 14 of the 18 models shown on the building cards at the same time. The perfect addition to support science, nature, life cycle, or creature unit. The Tinkertoy Big Top set includes 188 durable plastic pieces including spools, straight rods, bendable rods, wheels, eyes and two buildable figures. Builders aged 3+ can create a tent, animal, trapeze artist and more, or use their imagination for other spectacular events. The Tinkertoy pieces snap together and stay together for long-lasting play, and what's more, Tinkertoy rods and connectors can now be joined to Kid K'NEX rods and connectors, to build even bigger models. The colourful guide provides a variety of ideas for all building skill levels. Comes in a sturdy box with lid for easy storage and portability. The Tinkertoy Transit set includes 150 durable plastic pieces including spools, straight rods, bendable rods, wheels, eyes and two buildable figures. Builders aged 3+ can create a train, garage, bridge and more, or indulge their imagination with other ideas. The newly-redesigned Tinkertoy pieces snap together and stay together for long-lasting play, and what's more, Tinkertoy rods and connectors can now be joined to Kid K'NEX rods and connectors, to build even bigger models.